A screen shot of a trip request on Bing from 7th/Figueroa to Wilshire & Crenshaw. 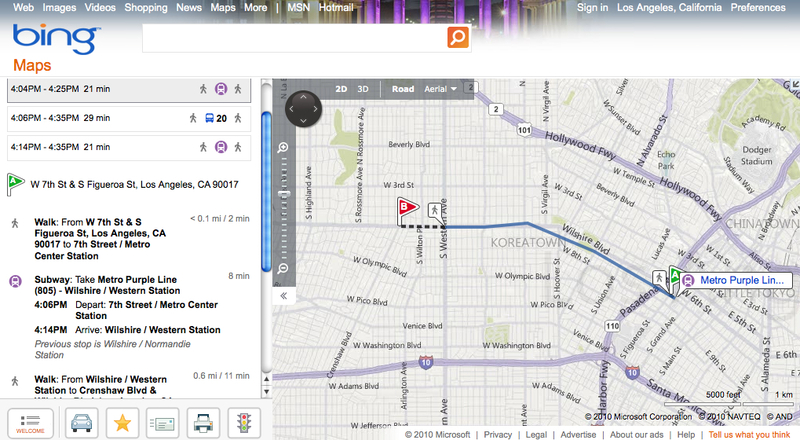 We recently got the news that Microsoft’s Bing had just released Bing Maps with Metro bus and rail trip information. Microsoft started the service last month — with information initially for 11 major cities, including L.A. Chicago, Minneapolis and New York. It’s fairly obvious that Bing wants to compete with Google, which already provides such info on its maps. Bing also has Metrolink schedules, but no info yet for the muni bus lines in L.A. County. I took Bing maps for a spin is the first time yesterday. I like the interface, but it didn’t take long for me to find a glitch. In the map posted above, I asked Bing for directions from 7th/Figueroa in downtown L.A. — i.e. the 7th/Metro Center rail station — to Wilshire/Crenshaw. But Bing maps didn’t seem to recognize that I could transfer to the 720 Rapid Bus after getting off the Purple Line at Wilshire & Western — and instead ordered me to walk the .6 miles. Hmm. In Bing’s defense, there were other trips it seemed to competently plan. I’ve also found glitches in Google Transit and Metro’s Trip Planner — there are simply times when logic fails all these programs. Two problems–one serious, one not so. The serious problem is that the Trip Planner tends to trope towards trips with a smaller number of transfers, even if an extra transfer might give you a shorter trip. For example, the Trip Planner won’t give you the Blue Line-Red Line-Gold Line for a trip from downtown Long Beach to Downtown Pasadena, even though it would probably be faster than the one transfer rides it suggests. The not so serious flaw is when the Trip Planner tells you to assume Jesus Christ mode and walk across the LA River when the nearest stop is at an (unbridged) section of the other side!